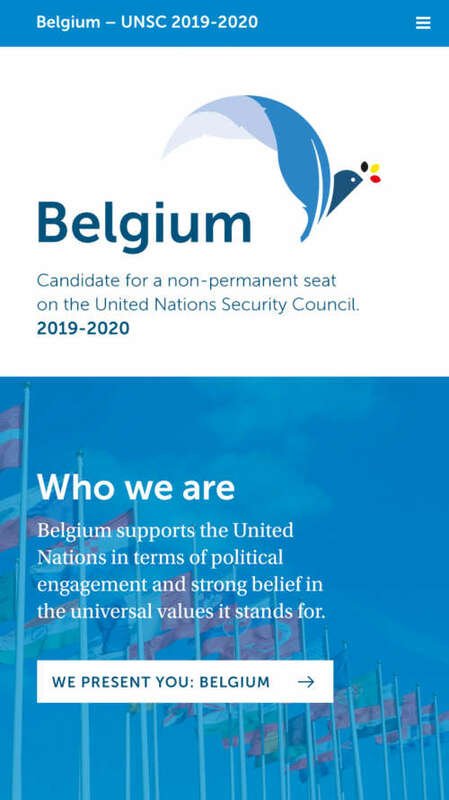 Belgium, one of the founding members of the United Nations, has recently launched its campaign for a non-permanent seat in the UN Security Council 2019-2020. 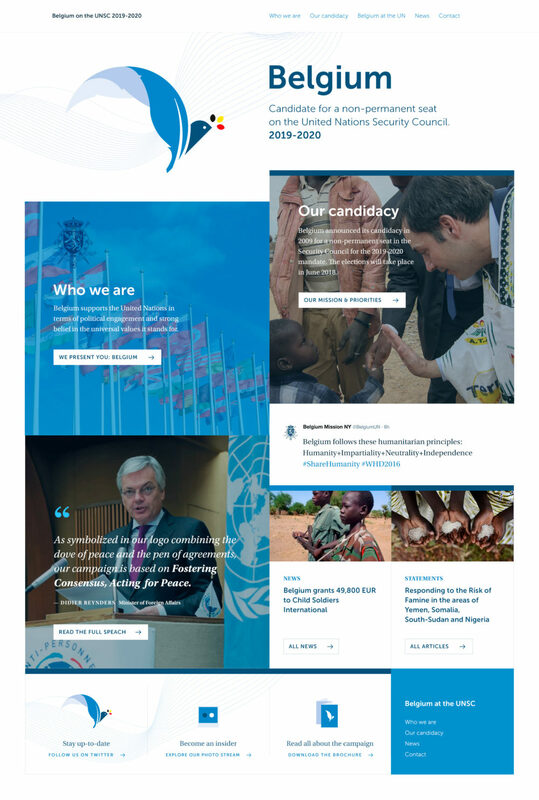 To design the campaign’s visual identity, The Belgian Ministry of Foreign Affairs needed a creative agency with loads of experience. That’s where Pong Ping came in. 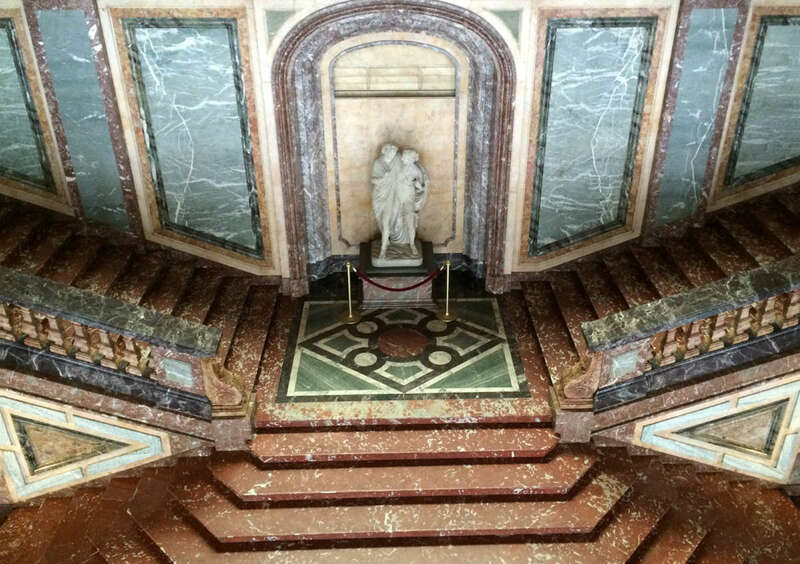 This project was our first assignment for the Belgian Ministry of Foreign Affairs. This one came with a promise. 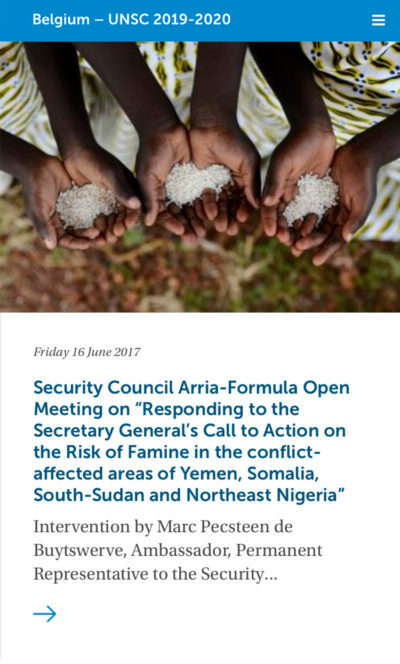 If elected as a non-permanent member of the UN Security Council, Belgium will promote an ambitious agenda for peace and security worldwide. 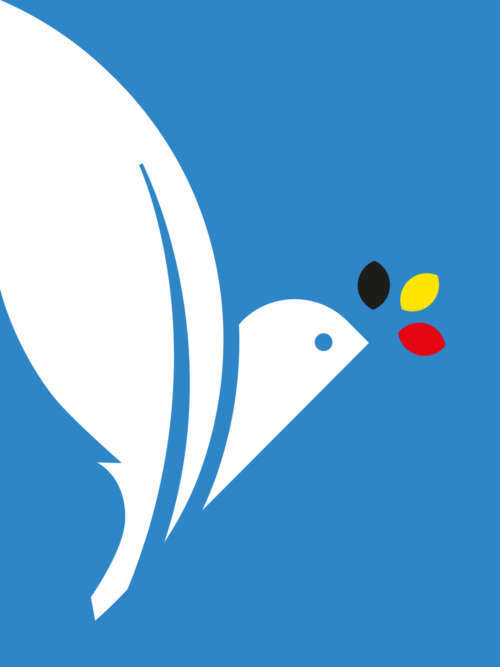 More then ever, Belgium’s primary focus will be on building peace, defending human rights, supporting sustainable development and fostering consensus. 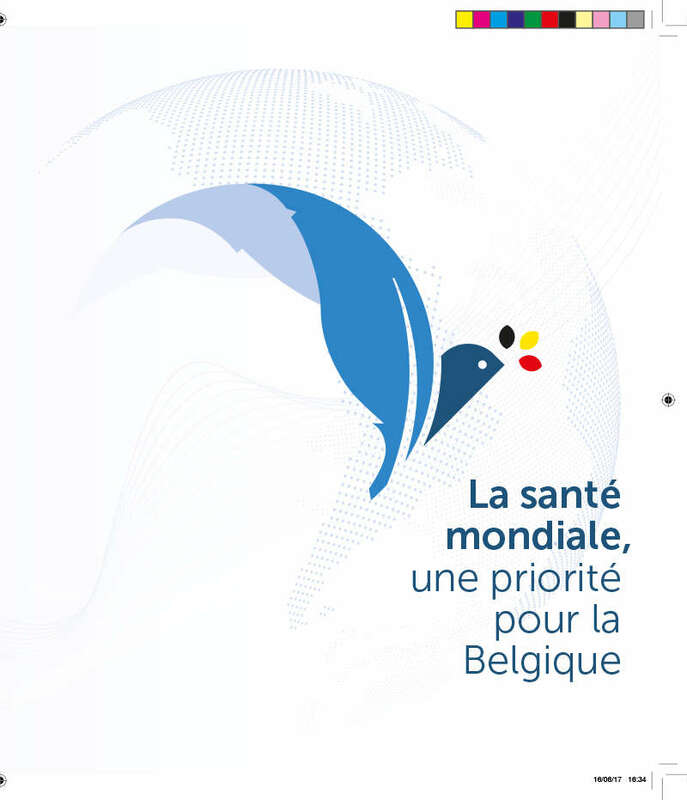 The goal of the campaign is to mobilize the Belgian network of contacts, both national and international. 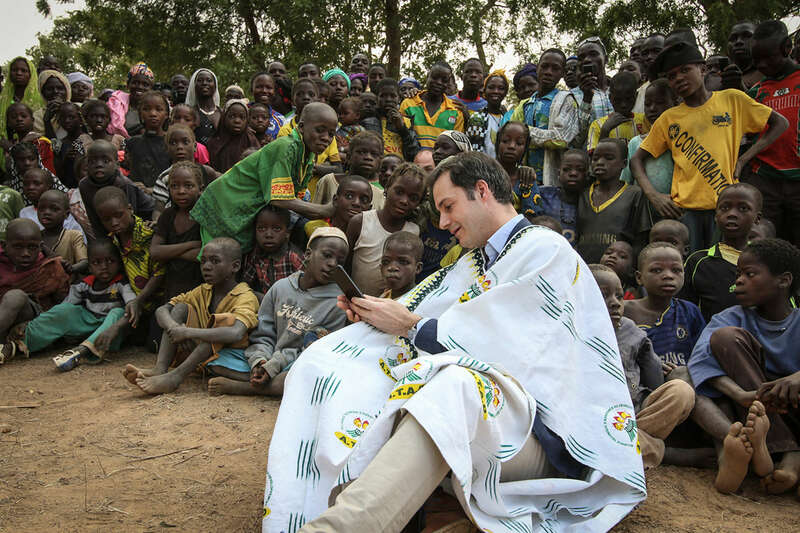 Not only should the word be spread among public authorities, but also among scholars, businessmen and –women and civil society. 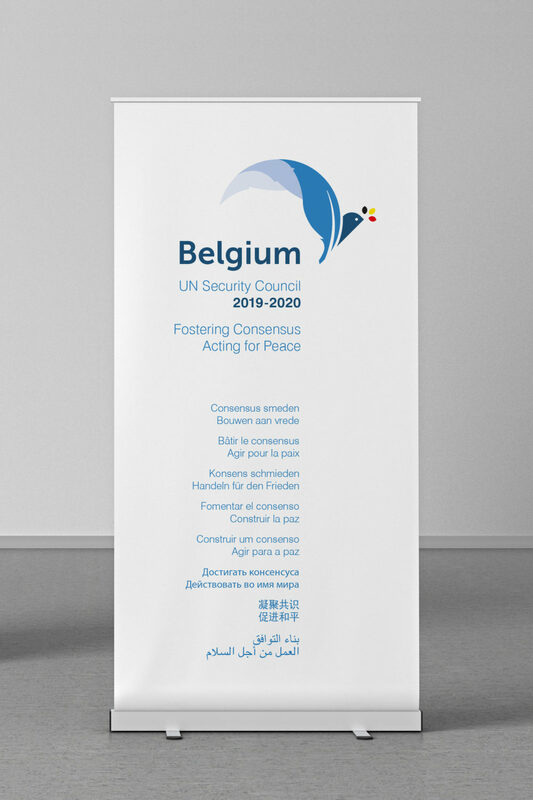 It calls all citizens to contribute to the success of Belgium’s candidacy for the UNSC. Our mission was to bring the campaign’s overall communication to the highest possible level, using creative illustrations, high-quality images and eye-catching typography. 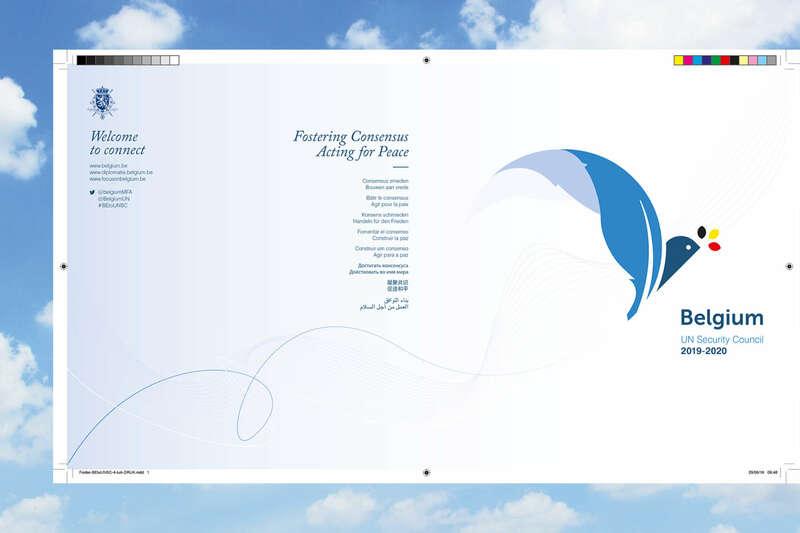 The project started off with the design of a campaign logo. After exploring dozens of options, everyone agreed on the perfect logo. 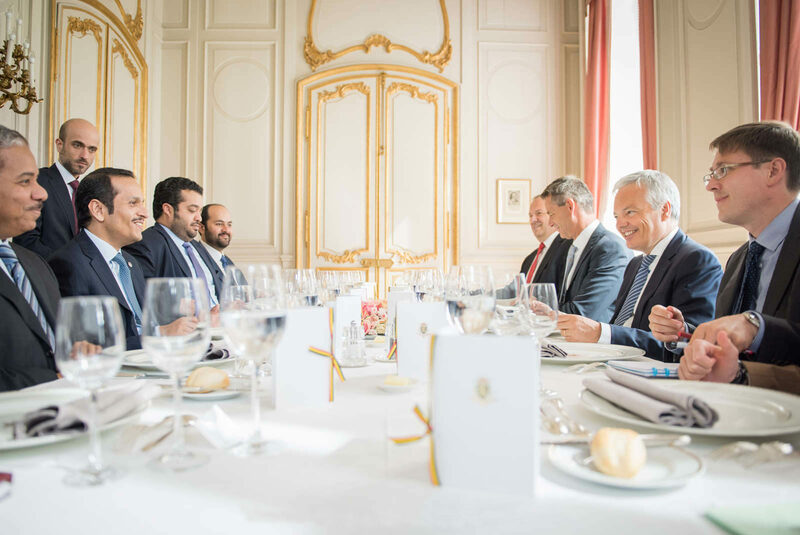 It symbolizes the long-standing role of Belgium as a mediator, which is characterised by Belgian diplomacy always looking for consensus, bringing parties together, and finding peaceful solutions to conflicts. Our team created a complete series of online and offline tools, branded elements and promotional material. 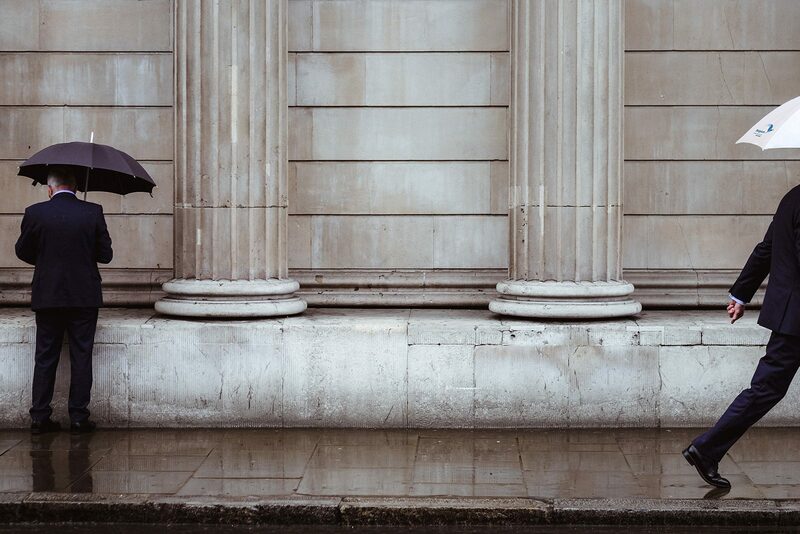 From a website to digital banners, e-mail signatures and postcards to brochures, pins and even umbrellas. 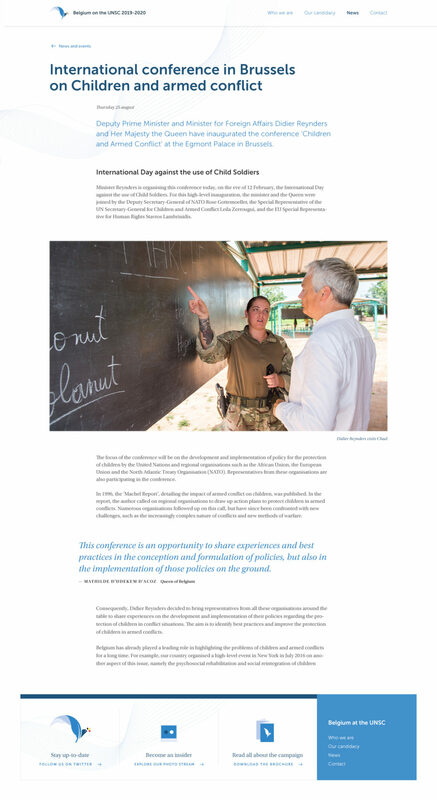 To serve the target broad and international audience of diplomats and decision-makers, all communication was translated in seven languages. 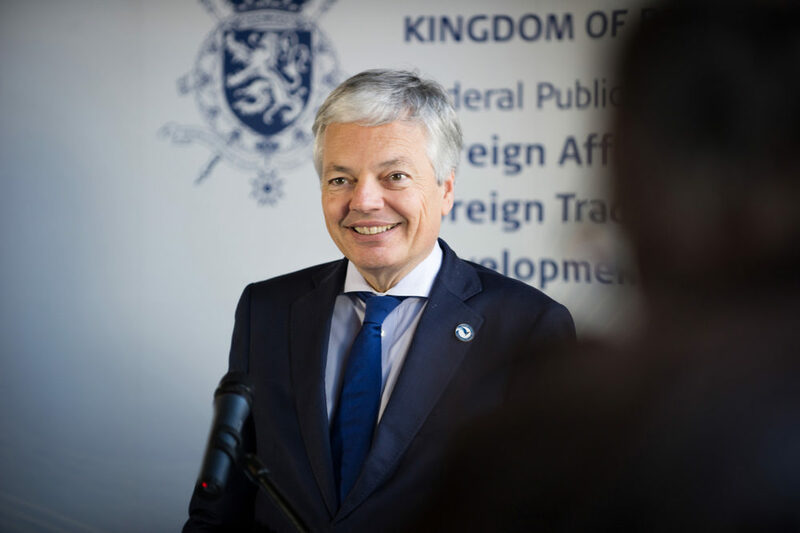 Together with Their Majesties the King and Queen and the Deputy Prime Minster, Minister for Foreign Affairs Didier Reynders unveiled the campaign logo and the slogan: “Fostering Consensus, Acting for Peace”. 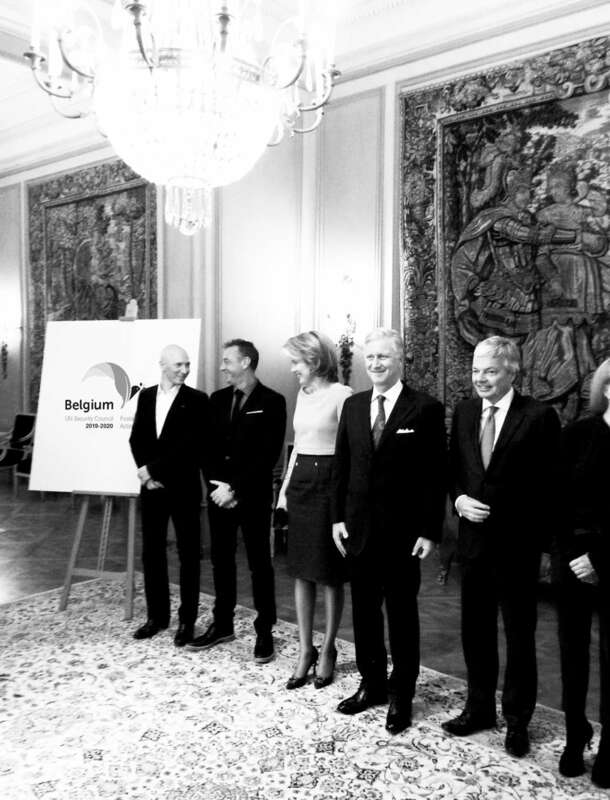 This official presentation was a rare opportunity for us to meet the royal couple and even have a chat with them. We don’t want to break protocol and spill the beans, but they looked quite happy with the result. 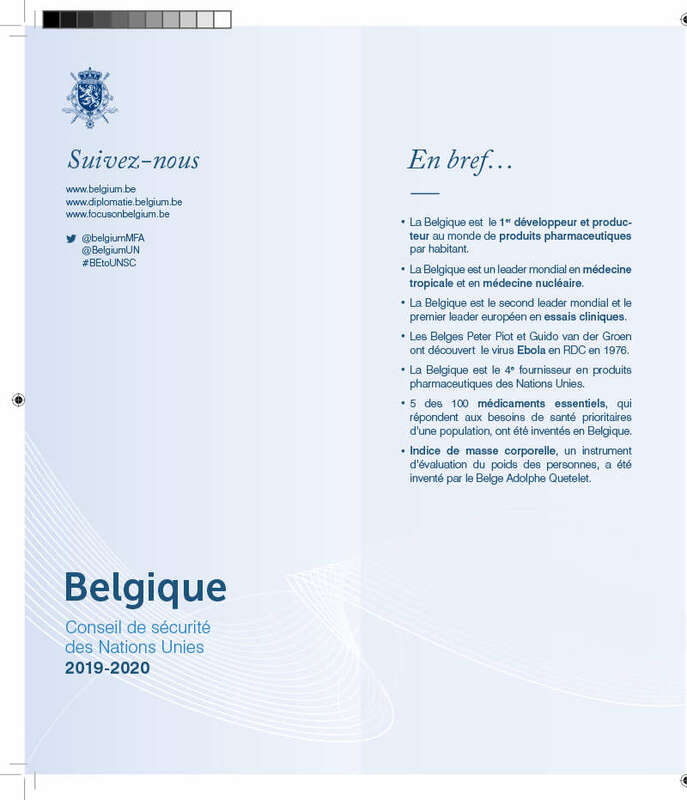 The next step was to design a complementary website which instantly proves Belgium is the ideal candidate to join the UN Security Council in 2019-2020. 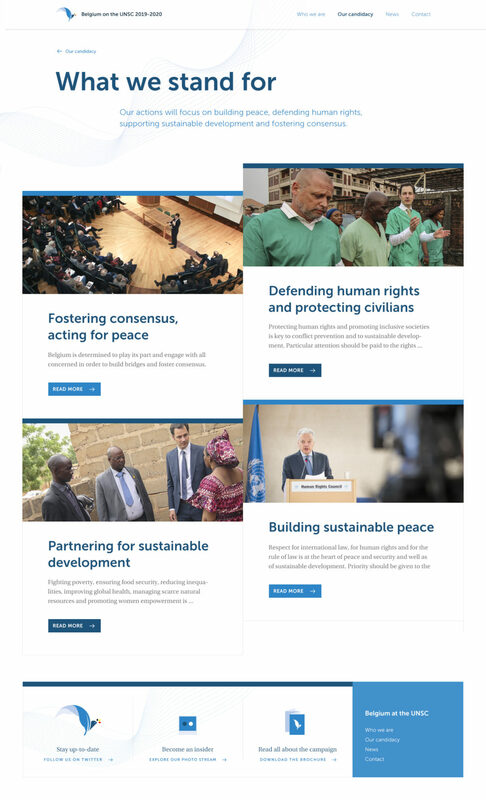 A well-designed interface invites online users to read the full campaign story, connect through social media and follow the campaign trail thanks to the official photo stream. 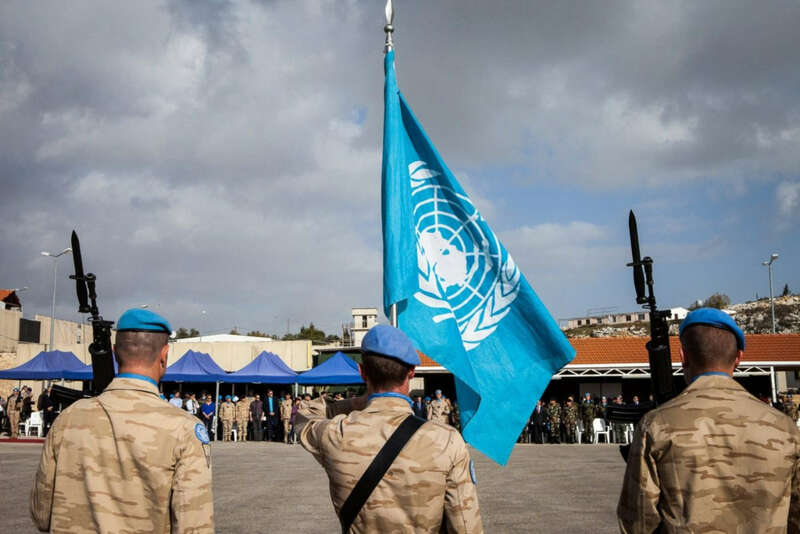 Our goal for this campaign was to demonstrate Belgium’s broad set of diplomatic skills and symbolize its long tradition of peacekeeping in UN missions around the world. 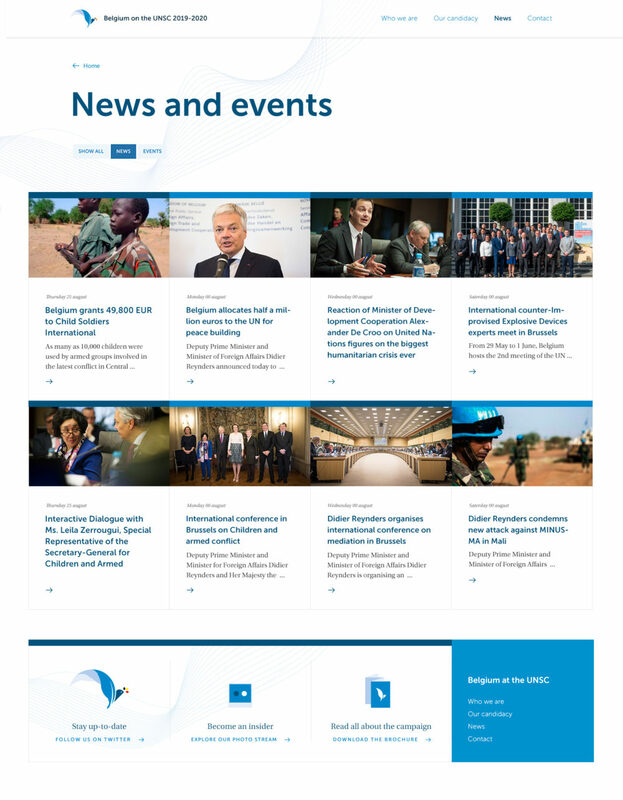 A clean mobile version of the website was designed and developed, ensuring maximum readability on tablets and smartphones. 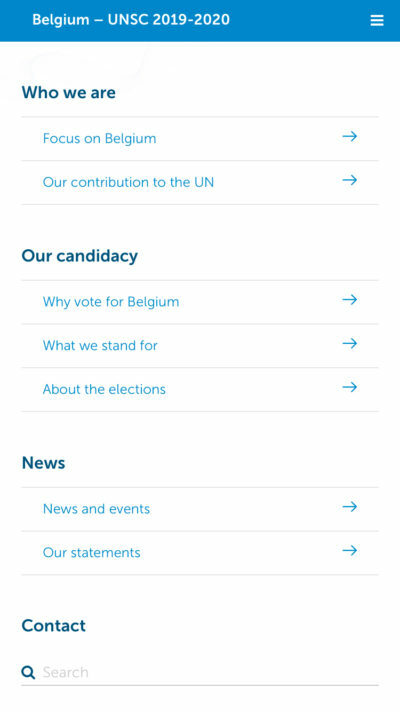 The latest news about the campaign, events and official statements are accessible through just one simple menu.